Begin by sketching a rough circle. 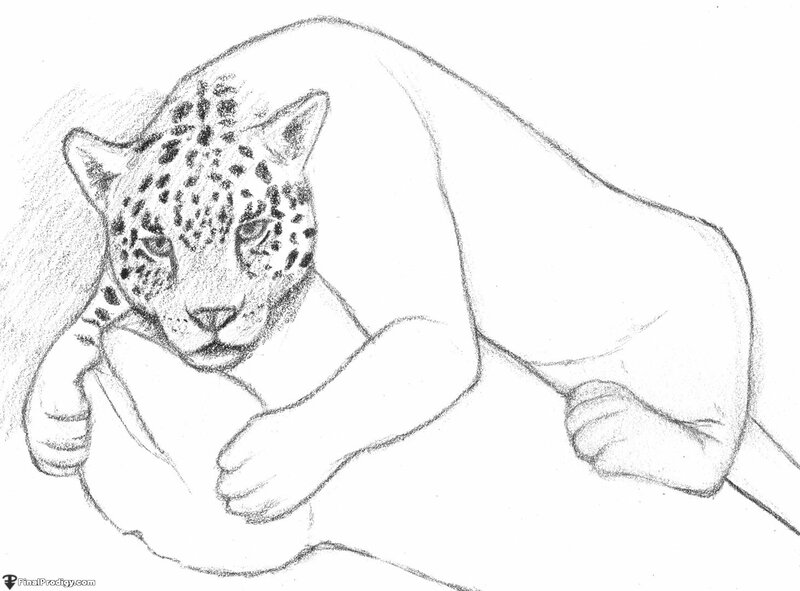 Build rough guidelines for the jaguar's head and spine from and around the circle. Sketch as lightly as possible. 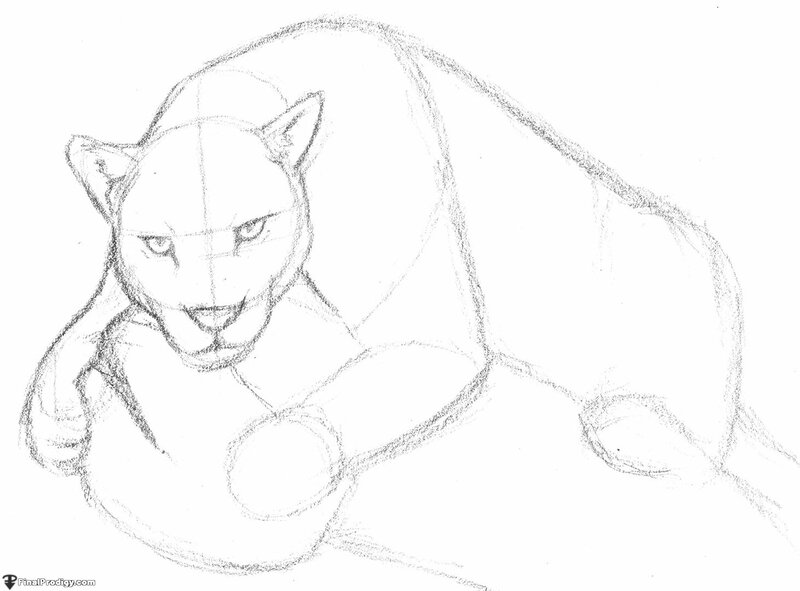 Sketch in guidelines for the rest of the drawing. 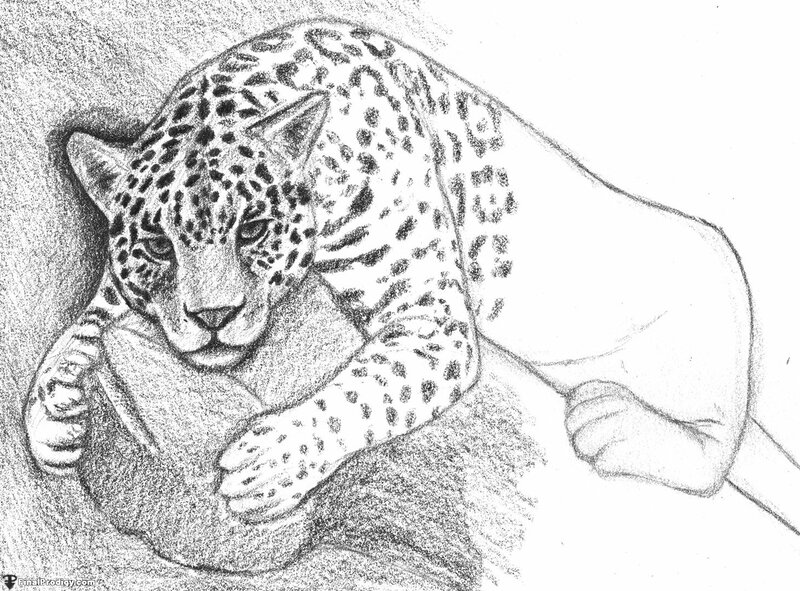 Sketch in a basic tail, basic legs, paws, as well as the log that the jaguar is resting on. Start more detailed features on top of the guidelines. Start by concentrating on the head and the left side of the drawing. Add more detail to the rest of the drawing. Make sure to continue sketching lightly. 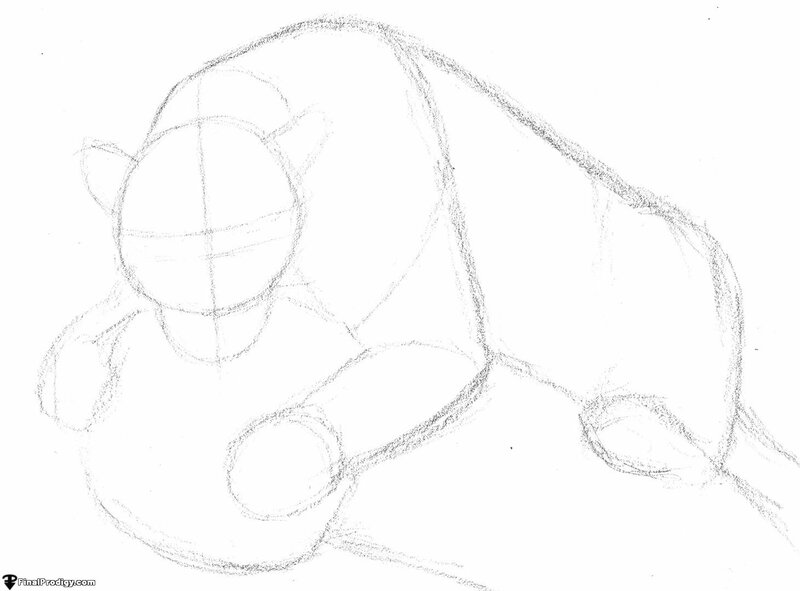 Begin cleaning up the sketch by redefining the left side. Erase any unneeded guidelines and redefine the outlines without going into too much detail. Redefine the lines on the right side of the drawing. 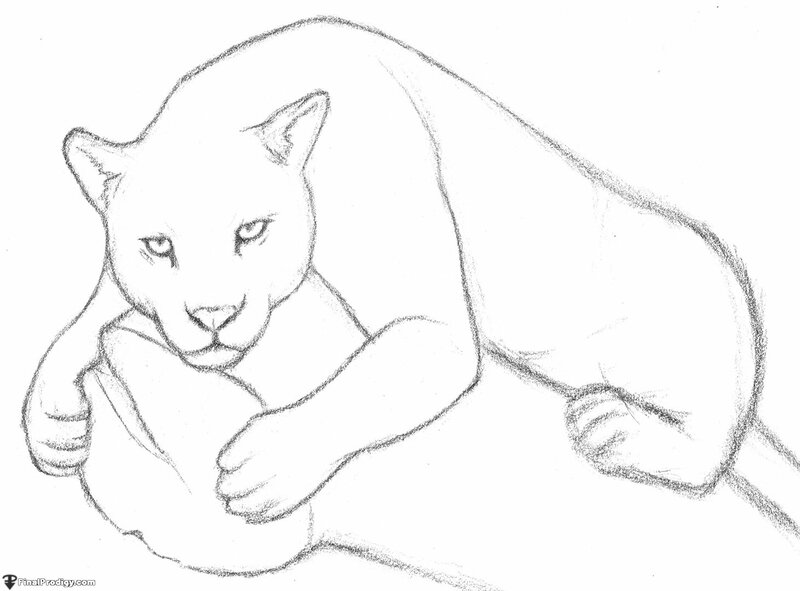 This sketch is the base for the rest of the drawing. Make sure that it is satisfactory before moving on. 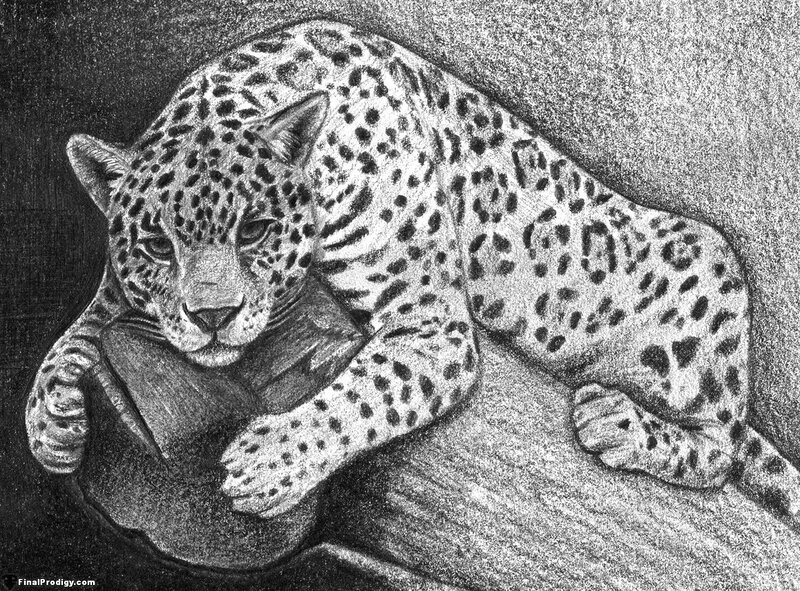 Using a soft pencil (5B) begin adding rough shading to the drawing. Start with the head. 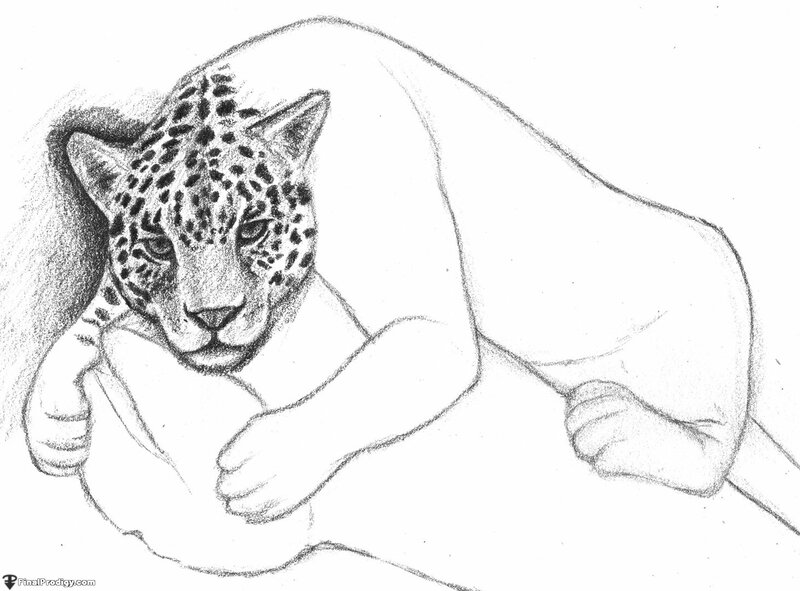 Try to make the jaguar's spots look natural by not making the patterns perfectly symmetrical. Shade lightly by barely pressing the pencil into the paper. Use an HB pencil to build up the shading without going into too much detail. 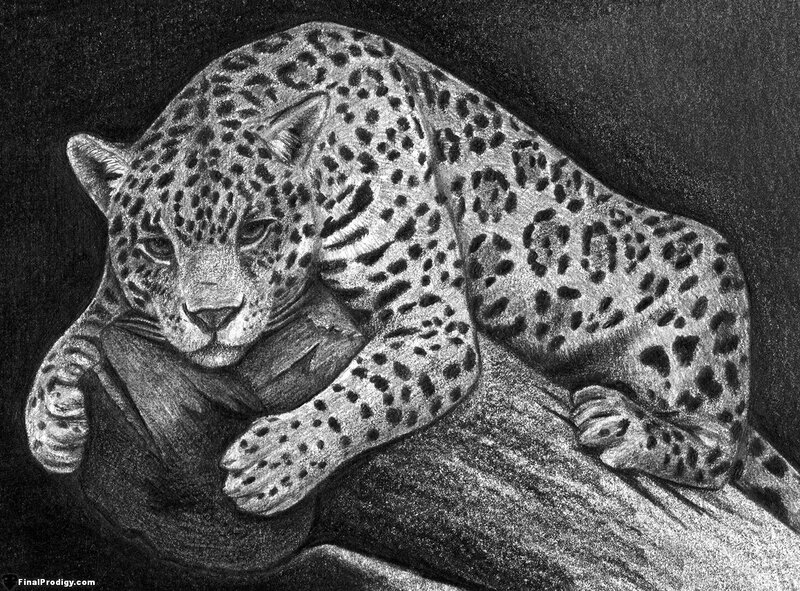 Shade over the spots and define the outlines around the jaguar's head. 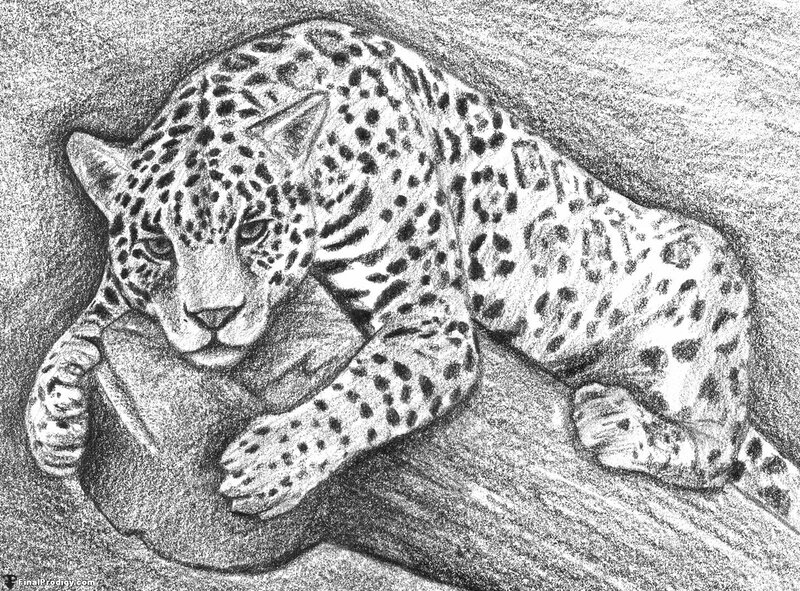 Use a soft (5B) pencil to add rough shading to the front legs, jaguar's back, and the left side of the log. Build up the basic shading in the background as well. Use an HB pencil to build up and define the shading. 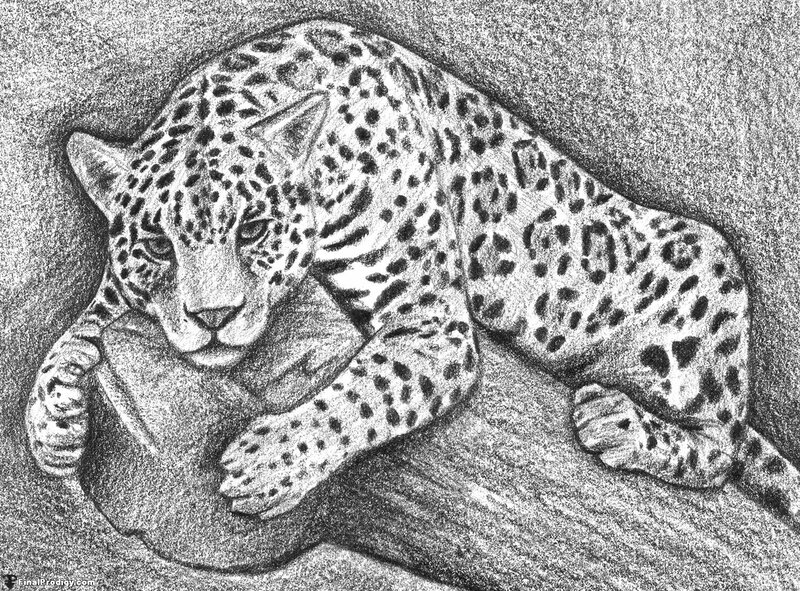 Concentrate on the spots and outlines. 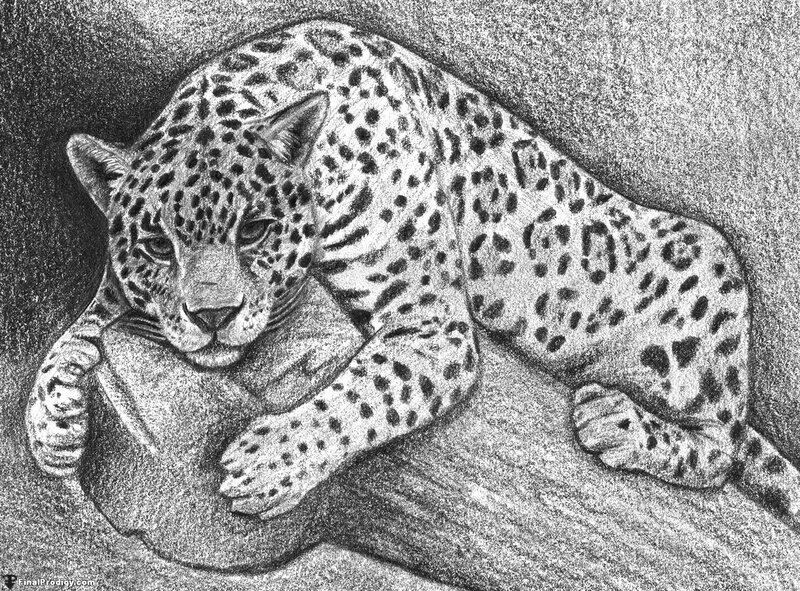 Use a soft pencil (5B) once more to add rough shading to the rest of the drawing. Use an HB pencil to define the rest of the shading a bit more. Begin adding the final layer of shading. 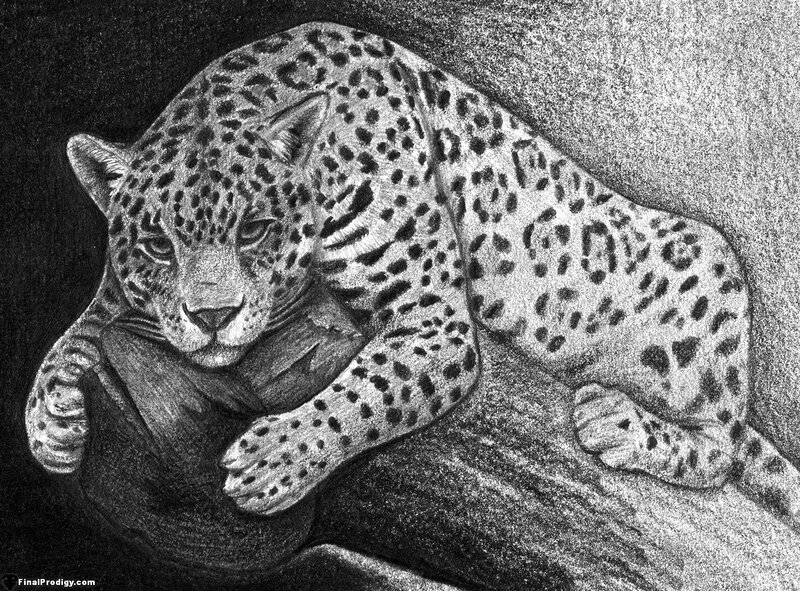 Go over the dark details with HB and 5B pencils. 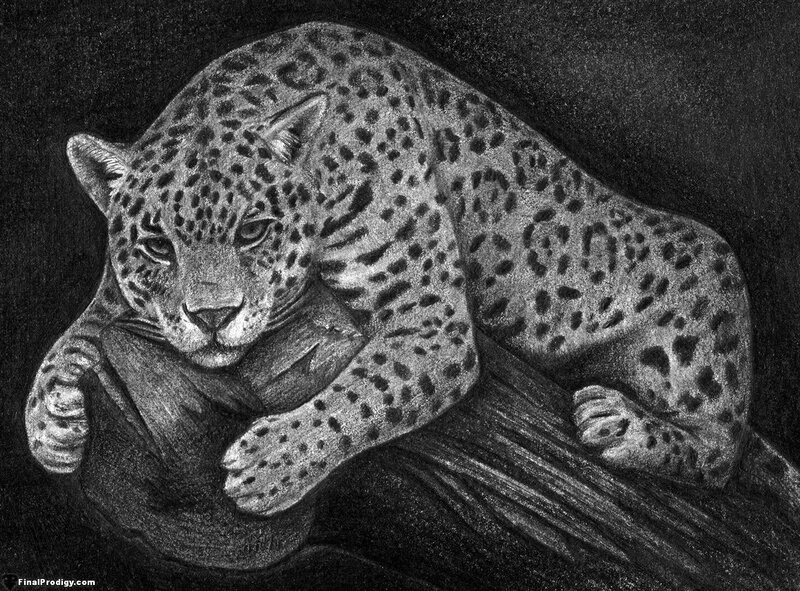 Use a 3H pencil on light/fine details (fur and whiskers). 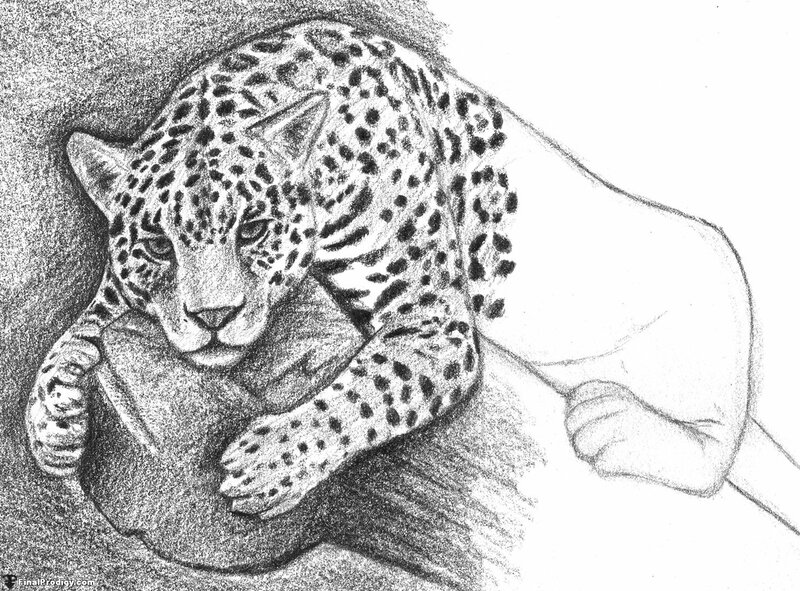 Add another layer of 5B shading to the background; use an HB pencil to smooth out the shading. Add details the the rest of the far left side of the drawing. and make the background as clean as possible for now. Define the rest of the left half of the drawing. Add details to the log with HB and 4H pencils. Define the rest of the body shading and build up the background on the right side. Blend in the background shading with a blending stump if it appears to rough/textured. Define the rest of the log using 4B and HB pencils. Add finishing touches to the drawing as a whole. Lightly smooth out the shading here and there using a blending stump without compromising details and textures.